July 21 Saturday Sounds presents Too Fat Guys LIVE! Saturday Sounds presents Too Fat Guys LIVE! 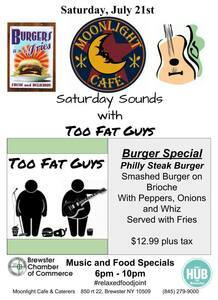 Join us for the Rocking Soulful Sounds of Too Fat Guys and a Philly Cheese steak inspired burger special.